The month of celebration is a time to be merry, eat, give, and be together with loved ones. My favorite time of the year is almost upon us and I can't wait to celebrate this festive occasion with everyone. People celebrate the month of celebration in different ways. On Neopia, the Winter Starlight celebration is in full bloom. Snowager is hibernating during winter, winter games are all the rage, people hanging their stockings by the fireplace for Stocking Stufftacular are eagerly awaiting their special gift, and the Advent Calendar is once again finally live and giving out free presents a day. 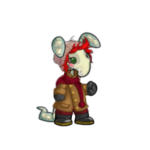 A Neopet entering the Winter Starlight celebration will see a place alive with winter activities and fellow Neopets from all over Neopia dressed in their holiday best to celebrate the season. With our decorations put up before the month of celebrations, we thought that now would be a good time as any to help others in their customization looks. 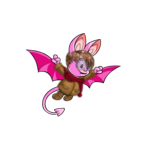 We have seen lots of holiday customizations in the Neopian Times and around Neopia. Pets dressed in their best are an inspiration for us all. 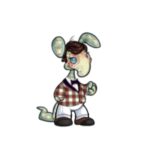 Because the idea of customization isn’t new, we have decided to focus instead on a Neopets’ environment/surroundings. 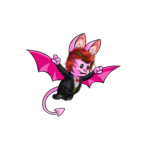 We first got our hands on an invisible Neopet. To better see our environment, having an invisible pet was our only option. We went for six looks with three being focused outside and three on the inside. We did four NC environments and two NP environments. Two NC looks were indoors and another two were outdoors. With the NP looks, we only have one indoor and one outdoor. 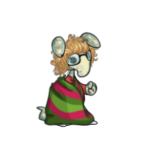 We also customized some Neopets that could fit into our environments on each look, having a boy and girl look. They are there to only give you some ideas. You can find all these environments in December, with a heavy focus on the holidays. Christmas markets are places we can find everywhere. 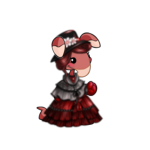 In Neopia, the idea of this customization was focused on taking a break at the Christmas market. The Christmas Eve Tent Background is where any Neopet can go, warm up from the cold, and take a break before venturing back to the market. The White Christmas Side Tree, Snowflake Shower, and Holiday Bell Garland were used to give you a holiday feel. 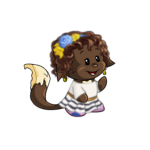 Without a proper environment for your customization, you can't tell your Neopets story. We can all agree that music is a big part of Christmas. It makes us feel the Christmas spirit and joy! This time of the year you can hear joyful singing around towns all over Neopia. Caroling is a fun way to connect with people and come together in music. If you love Christmas music as much as we do then why not join the caroling choir to spread Christmas feelings and joy to all your friends and neighbors! 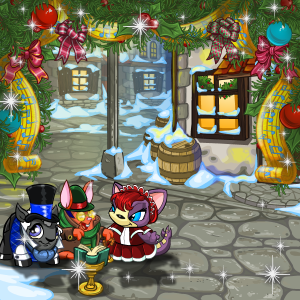 In this environment you can see a Petpet Carolling Chorus knocking on doors caroling with others in this Sparkling Winter Town Background. I also used the Holiday Sheet Music Garland and Dyeworks Grey: Faerie Dust Shower to give it some extra sparkle to the performance. Let’s celebrate the Christmas season with a party. Let’s be festive together. Put on your favorite Christmas dress, suit or why not a fun tacky Christmas sweater and join your family members and friends for a good time. There will be gingerbread cookies, holiday punch drinks and much more to enjoy. This environment is very busy and it gives us the feel of a festive party. 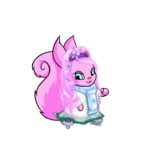 I used the Holiday Party Background, Holiday Sparkle Shower to light up the room, Holiday Star Garland, and the adorable Helpful Abominable Snowball. Being with family is the most important thing about the Christmas holidays. I wanted to use this background to portray a Christmas dinner. There is a coziness with this background because of the fireplace and the table setting tells my story without adding too much to this surrounding. 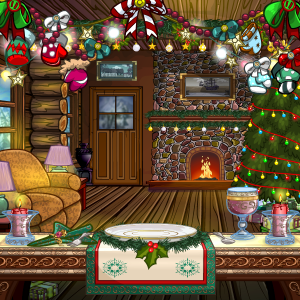 I used the Fancy Christmas Dinner Table, Holiday in a Cabin Background, and Lost Mittens Garland. The winter weather outside is frightful but that doesn't mean that you can't be outside and enjoying some winter activates. It's also the time of the year you can finally enjoy ice skating outside on ice. 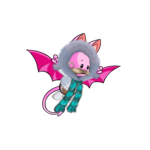 Put on your warm winter gear and join the other Neopians on the ice for some fun. Show your ice skating arts or enjoy some fantastic ice skating performances being offered. 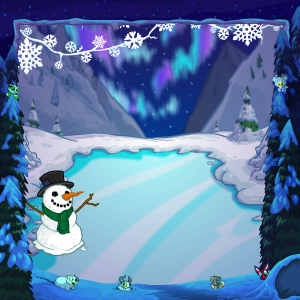 In this environment you can see the beautiful Scenic Mountain Top Background, Advent Calendar Y17 Frame, Tiny Snowman, and Ice Garland. 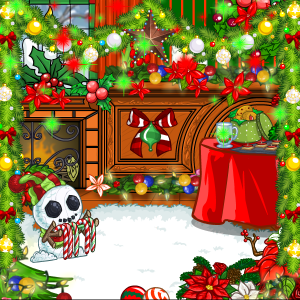 These items together makes the surroundings look more festive for Christmas. Thank you so very much for taking the time to read our article. I hope we gave you some ideas on how to customize your pets and their environments to tell a story for the holidays.